Action Pinball - Dead Williams Games (Level 3 - Level 7): Common failures and solutions. This article deals with Williams pinball machines using MPU boards Level 3 through Level 7 (1977 through 1984), and is intended to help you find out why your game won't start up when you turn it on, or why it may be resetting or "crashing" during operation. This means you may only get general illumination lights working on the playfield, but no displays or feature lamps, no response to the diagnostic buttons inside the coin door, and no response to coin chute switches or start button. Remember not to leave the game on very long (more than a few seconds at a time) while troubleshooting problems like this. In this state, the game is basically "locked up", and no strobing is taking place on the driver board, so you run the risk of burning up feature lamp driver power resistors and coil driver circuitry, if the fuses don't blow first. I always remove the coil and feature lamp fuses on the power board until I get problems like these resolved. With coil and feature lamp fuses removed from the power board, you can safely leave the game on while you troubleshoot. Diagnostics: When the MPU board is locked up or not booting at all, pressing the diagnostic button on the board in this state will provide erroneous information, so you should not rely on anything that it indicates under these circumstances. Check Fuses: On a game that is "dead" and won't power up, first check to make sure fuses are good on the power supply board- specifically the fuse(s) for the 5vdc logic power supply, as it is what supplies power to the MPU board for the game to boot up and run. Coil and feature lamp fuses can be removed (and should be) when troubleshooting problems like this, at least until the problem is solved. Also check to make sure the game is getting power- check line cord, presence of power at wall socket, and main line fuse in the main cabinet. These LEDs can also display other information, or codes, that can indicate the possible cause of failure if the MPU board is not booting up. In this case, L3-L6 games will have both LEDs come on, go out, then either or both will come back on to indicate a problem. L7 games will show a number on the 7-seg display. If the MPU is showing any of these "error" codes, you may want to take their suggestion and investigate the problem, or try some more of the suggestions below to see if they help clear up the problem. For a chart of error codes, click here. - Pin 6: (Unregulated 12vdc) Should show about 13.5 to 16.5vdc. - Pin 7: (Regulated 5.0vdc) Should show about 4.9 to 5.2vdc. Cracked Solder Joints: Check for cracked solder joints on the backs of all connector pins on all boards. This is a very common problem, especially in these 20+ year-old games. Joints can easily crack from old age, vibrations, and from connectors being removed and replaced numerous times over the years. Remove boards and inspect solder joints on connector pins on back side of board. Reflow solder on any joints that even look marginal. We always find at least two or more cracked joints on various boards in each of these old games that we work on. We ALWAYS remove all boards, and check for cracked solder joints, and even reflow most of them just to be safe, on all the old games like these that come through our shop. We can't stress this step enough- it is an absolute must to guarantee any reliability from your game at all. DO NOT SKIP THIS STEP! Try Running Game Without Driver Board: Try removing the driver board completely from the game and booting up that way- does the MPU do anything different (any different number on the LED indicator?) This may help determine if the problem is located on the driver board, or on the MPU board. Poor Connections in MPU/Driver Connector: This is probably the most common source of problems in these games. You may have poor connection(s) in the 40-pin inter-board connector that goes between MPU and driver. Remove both MPU and driver boards from the game and reflow the solder on the backs of the pins on the MPU board. Clean the interboard connector with a contact-cleaner solvent- don't use abrasives as the plating on the pins is very thin, and removing this will leave only the bare steel which makes a very unreliable contact. Using an abrasive material (sandpaper) may get the connection clean enough to work temporarily, but the pin can oxidize and cause problem to return. You may even need to replace some of the header pins with new pins if they are too worn. Check all other connector pins while you've got the boards out- cracked solder joints on connector pins in these old games is a VERY common problem. Look for any smashed, corroded, bent, broken, or missing pins in the female (driver) side of this connector. This is a fairly common problem, and any bad pins in this side of the connector must be replaced for reliable operation. If reset/lock-up problems persist, you may want to replace pins in the 40-pin inter-board connector between MPU and driver. I have had some 'stubborn' games where cleaning/adjusting the pins never did work reliably, and the only cure was to replace at least the male pins. Some games may necessitate replacing the female pins (on driver), too, which are a little tricky to find from suppliers. Poor Connections in Chip Sockets- MPU Board: Remove and reseat any/all socketed chips on the MPU board. Clean chip legs if they appear oxidized (black). Remove/reseat in the chip socket several times repeatedly to help clean the connections between socket and chip. Make sure there are no bent or broken-off legs on any socketed chips. If so, replace chip, or straighten the leg(s). BLANKING Signal Stuck: If coils energize when game is turned on (and coil fuse is installed), then the BLANKING signal may be stuck LOW, which can be caused by connector problems (see above), or can also be caused by problems with various circuitry on the driver board. The BLANKING signal originates on the MPU board, and runs down through the driver board, so any component along the BLANKING signal's path could be holding the signal LOW, thus all coils are energized. Try a different (known working) driver board and see if problem goes away. If so, then the original problem is confined to circuitry on your driver board, but *could* possibly still be due to poor connections in the 40-pin inter-board connector- never rule it out. 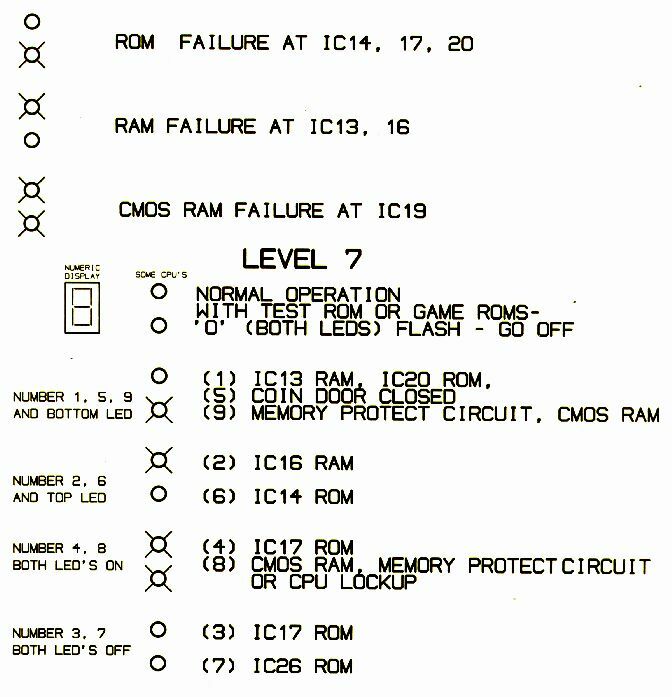 Bad IC19 CMOS RAM: The 5101 CMOS RAM chip (IC19) may have been taken out with a "crash" or game reset failure, or even static discharge or a power surge. So this may need replacing if all else fails- I've had a few of these go from poor connector problems, or lock-ups in the middle of games. This chip is very susceptible to these problems. Remember to always install a chip socket on the board if you are replacing a chip that was originally mounted directly to the board. This helps in future troubleshooting and chip replacement, and helps preserve the life of the board. If there are any other socketed chips on the MPU board, you may consider replacing them one at a time, if you have them, (including pre-programmed ROM or EPROM chips), to see if any may be at fault. This isn't a real practical approach to troubleshooting- it's more or less "guess work", but something to try if you're out of suggestions and you have a supply of good spare chips. At this point, if you still don't have any results, it may be best to send the boards out for inspection/repair. Whenever a game is "dead" or won't boot up, the problem literally can be "anything". The above list of suggestions covers most of the more common causes of symptoms like these, but obviously can't cover every possibility.